Cinema is often a bold reflection of the world we live in. It speaks for the voiceless, aspires for the meek and brings hope to the despairing. Cinema is all encompassing, cinema is liberating! Wouldn't a medium as powerful as this, definitely have a lesson or two for management professionals as well? Ever wondered how Sidney Lumet's '12 Angry Men' can be linked to performance appraisals? What can Mickey and Malory from the controversial 'Natural Born Killers' teach young management professionals? What links the movie 'Boyhood' and 'Business Continuity Planning'? 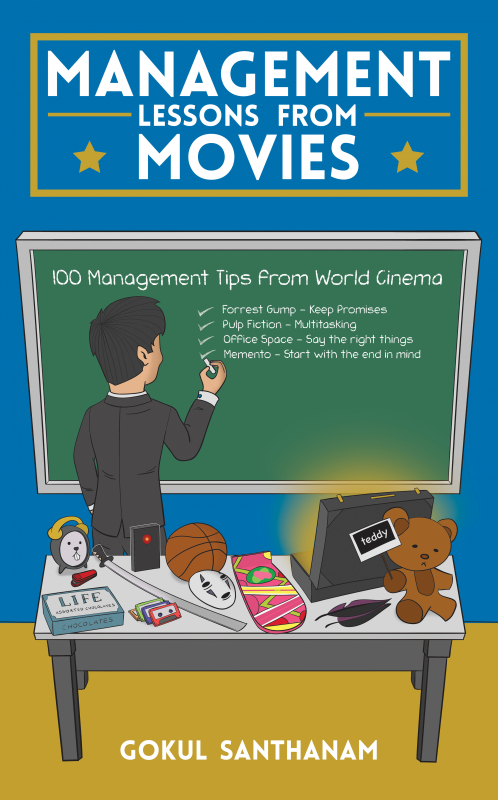 Management Lessons from Movies is your concise, easy-to-read book of movies and principles in management. The book unveils 100 management thoughts and covers 200 must watch movies. Explained through movies, the management concepts unearthed are sure to last with you for a long time! This book is definitely a must-have in your library! "A simple but effective concept to tie in movies and management lessons - as a movie buff and a CEO this book resonated with me totally! A must-read book for both movie lovers and management aspirants alike. Kudos to Gokul"
"I strongly believe the kind of films one watch has the potential to change one's personality, thought process, life style, etc. Gokul's book, emphasizes this fact in style. The list of films he has introduced and the management lessons he inferred from them are really interesting to read and also gives a strong motive to watch those films". Gokul Santhanam is a Sr.Vice President - Human Resources with a global information technology services company. He has done his engineering from SVCE (Madras University) and his MBA from XIME, Bangalore. With over 20 years of experience in the field of human resources, he is popular amongst the HR fraternity and is a regular speaker at HR conferences and management institutes. Gokul is an ardent movie buff and watches around 250 movies in a year. He reviews them on Facebook (GokulReviews). He is a founder trustee of "The Social Catalyst", a non-profit trust. He loves traveling, cycling, reading, photography, culinary tours and meeting new people. Gokul lives in Chennai (India) with his lovely wife Viji and has 2 children – Akhil and Ankita.